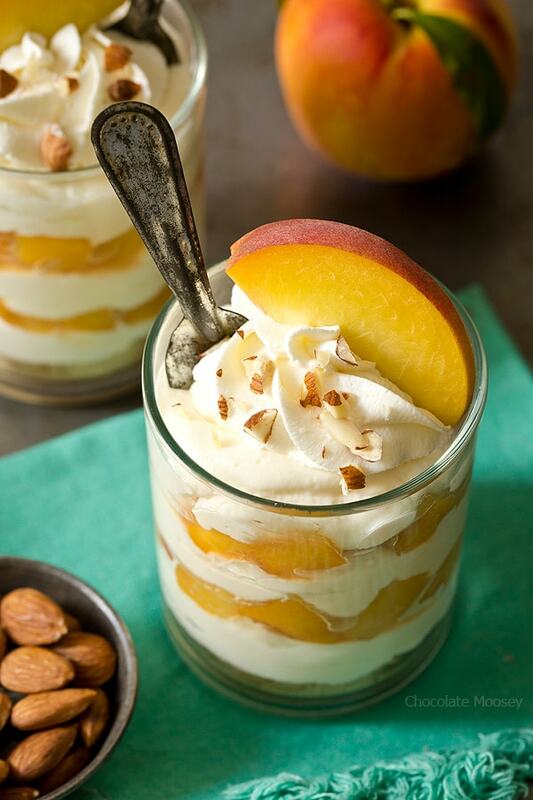 No Bake Peaches and Cream Cheesecake For Two – a refreshing, cool way to end your summer evening. Made with heavy cream and cream cheese (no Cool Whip). 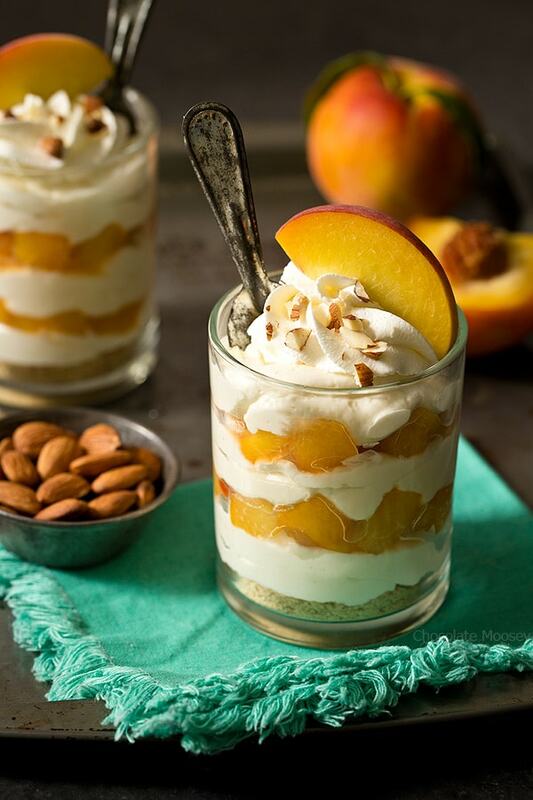 Serve them in a cup or ramekin or layer it with fresh peaches like a parfait. Every summer, Dad and I go peach picking at our favorite farm. Except this year I got the email saying due to the weather, the farm won’t be offering pick-your-own peaches this year. Bummer. Luckily peaches are still available at farmer’s markets for consumption, so we aren’t completely peachless. I’m not a huge eat-fruit-as-a-snack person, but for peaches I make an exception. The juicier, the better. If juice is running down your arm after one bite, you know you’re eating a good peach. 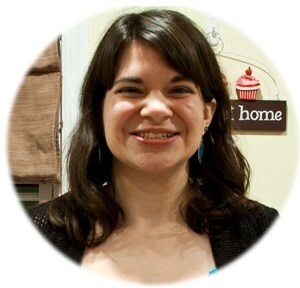 With favorite recipes such as Peach Cheesecake Crumb Bars, Peach Galette, and Cheesecake Stuffed Peaches, what could I make this year? Do I really need another cheesecake recipe (answer: yes)? Peaches and cream is a simple concept of serving fresh summer peaches with whipped cream. 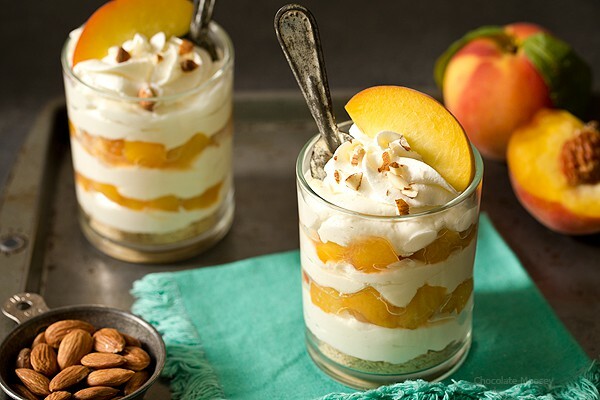 I took it one step further and added cream cheese with the whipped cream to make No Bake Peaches and Cream Cheesecake For Two layered like a parfait. It’s a refreshing, cool way to end your summer evening. No bake cheesecake for two with peaches is one of the easiest desserts you can whip up. First, there’s no baking involved. 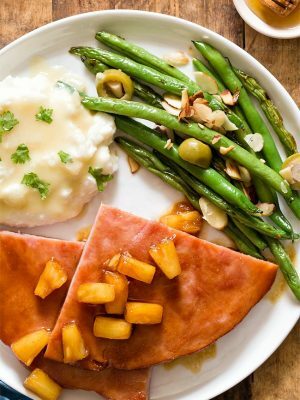 You do cook the peaches, but other than that, you use minimal heat. Second, you don’t need to bake a crust or cut the cheesecake into slices. Ever attempt to cut a no bake pie when it’s 90 degrees outside? It’s a mess. For a fancier presentation, layer everything into a glass of your choice like a parfait and dig in with a spoon. Third, you can make it ahead of time because cheesecake tastes better as time passes. The peaches are cooked on the stovetop first to soften them. I like a little bit of crunch to mine, but you can also cook them until really soft. 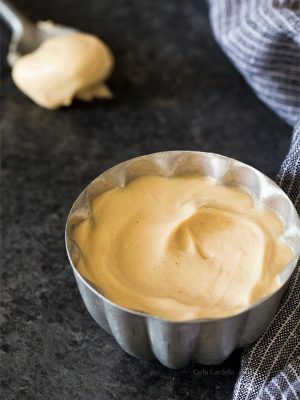 Alternatively you can make homemade peach pie filling. 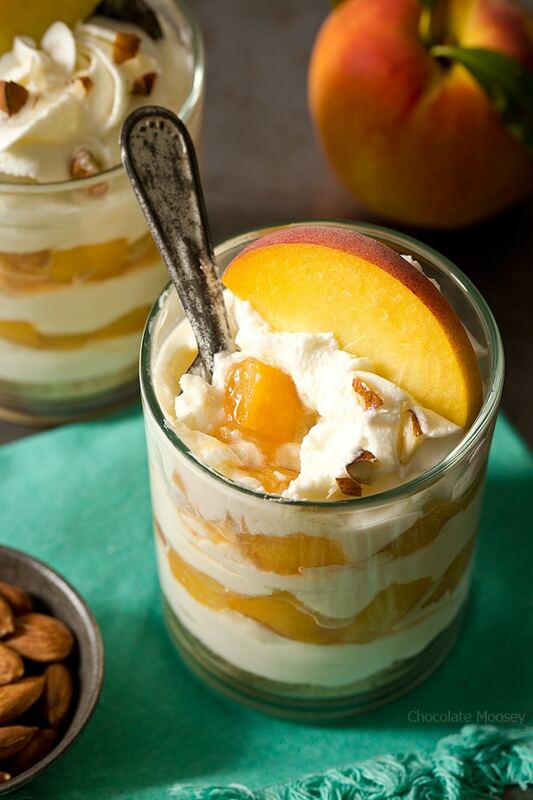 Then you layer the cheesecake filling with the cooked peaches and add chopped almonds for crunch. Not in the mood for peaches? 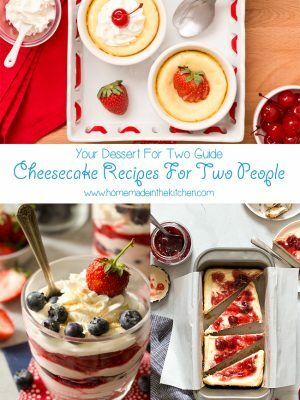 Check out my No Bake Cheesecake For Two with Fresh Berries. 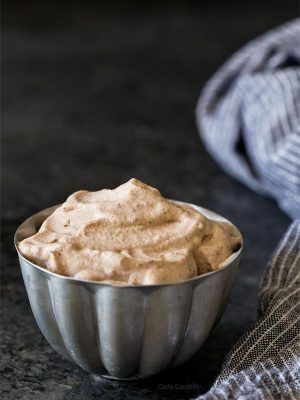 Instead of using Cool Whip, you make homemade whipped cream. 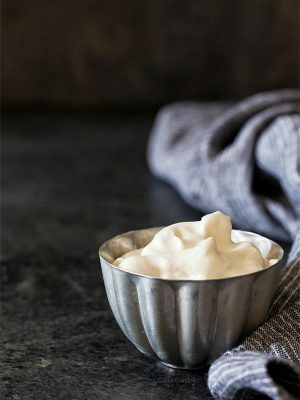 To save you some time, you make extra whipped cream in the recipe so you have some leftover to pipe on top. Why bother making another batch when you can make it all at once? For the peaches: In a large saucepan, bring peaches, sugar, lemon juice, and cinnamon to a boil. Boil for 5-10 minutes or until the peaches are soft. If there isn't enough liquid from the peaches, add a little bit of water. Remove from the heat and stir in the vanilla. Cool to room temperature. For the cheesecake: In a small bowl, mix together the crumbs and melted butter. Press into the bottom of two glasses or ramekins. Refrigerate for at least 15 minutes or until firm. Add some of the cheesecake filling on top of each chilled crust then add some peach filling and almonds. Finish layering with the cheesecake, peaches, and almonds. This sounds absolutely delectable, and from a calorie standpoint, probably more like breakfast than dessert. I think I need this for breakfast. The one thing I miss since moving from the east coast is tree-ripened peaches. We spend some time at the Outer Banks (NC) every year, and you’d better believe we eat a bunch of peaches while we’re here. I’m wondering if you can make this as a Trifle? 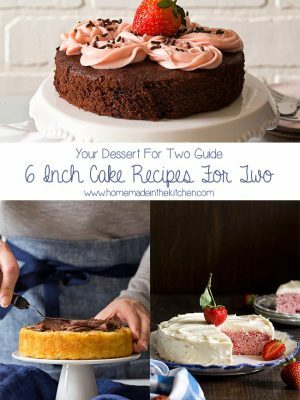 Do I need to double the recipe? 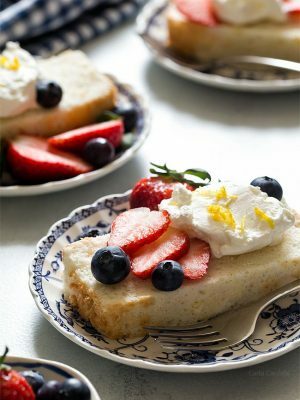 Yes, you can turn it into a trifle by adding cake pieces in between the layers. 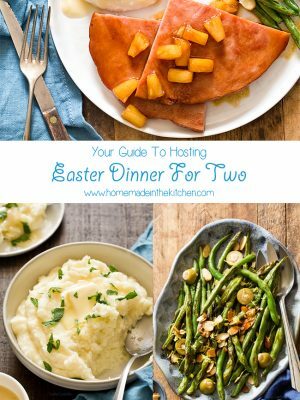 As for doubling the recipe, it depends on how many servings you want. 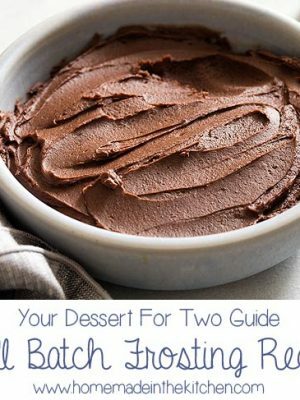 This recipe makes 2 servings. It won’t make a very large trifle, so I’m guessing you’ll probably need to double it, especially if you’re using a traditional trifle bowl. This sounds fabulous! 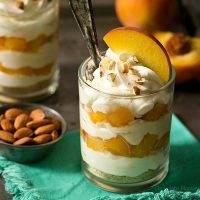 I have been looking for a recipe that uses peaches, especially those fresh Colorado peaches that are currently on the market! I like that you suggest swapping out the Cool Whip! I will try this soon.